(2004) "Hate It or Love It"
"Hate It or Love It" is a single by American rapper and West Coast hip hop artist The Game, featuring vocals from his former G-Unit member 50 Cent. 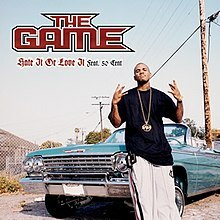 It was released as the third official single from The Game's debut studio album The Documentary (2005). The song features production from duo Cool & Dre, with additional production from Dr. Dre. The song features a music sample of "Rubber Band" by The Trammps from their debut album The Legendary Zing Album (1975). "Hate It or Love It" achieved commercial success worldwide. The track peaked within the top 10 in multiple countries, including the United Kingdom, Ireland, Netherlands and New Zealand. The single was commercially successful in the United States, peaking at number two on the Billboard Hot 100 for five consecutive weeks, becoming The Game's second top-five single on the chart as a lead artist and 50 Cent's eighth overall top-ten hit. It is The Game's highest-charting single on the Billboard Hot 100 to date. The song was kept from the number one position on the Billboard Hot 100 by 50 Cent's single, "Candy Shop", (featuring G-Unit Records' first female artist Olivia). "Hate It or Love It" reached the number one spot on the Hot R&B/Hip-Hop Songs, making it yet again another top five hit on the chart alongside "How We Do" which also featured 50 Cent. At the 2006 48th Annual Grammy Awards, the song was nominated for two Grammy Awards, including Grammy Award for Best Rap Song and Grammy Award for Best Rap Performance by a Duo or Group but lost in both categories to Kanye West's "Diamonds from Sierra Leone" and The Black Eyed Peas' "Don't Phunk with My Heart", respectively. Music critics praised the song as some of The Game's best work to date, as well for the nature of the song and it is one of his most well-known songs. The song first began to be conceived during the middle period of the recording process for The Documentary, in early 2004, during a recording process in which The Game would frequently fly to recording locations in New York City to work with 50 Cent: he would be given beats to hear along the way, to help inspire him. When he initially heard the production that would later become "Hate It or Love It", he did not display much interest, as he was "in a different mind frame" — conceiving more "hard hitting" records. However, on the flight home later that day, he took more of an interest and began to write the first components of the song. The chorus is sung and written by 50 Cent, who helped with the rest of the writing process and recording for the song along with The Game at his mansion in Connecticut. The song was even suggested for 50 Cent's album The Massacre (2005), due to 50 Cent's large artistic input. When The Game arrived at the mansion on the day of recording, 50 Cent presented him with several already part-completed records, with variously placed verses and choruses. The Game wrote his final verse first and worked backward, to avoid tiredness affecting his later verses. After 50 Cent heard the final version of the song after the recording process had finished, he was excited by its potential and felt the song would have to be one of the album's singles. It was later released as the album's third, after "Westside Story" and "How We Do", both of which also featured 50 Cent. The original production for "Hate It or Love It" first surfaced on a compilation CD, put together by Cool & Dre (who had been in contact with The Game since early 2002), and released unofficially to the local rap community. After G-Unit Records producer Sha Money XL received a copy of this disc, he requested a meeting with the duo, feeling that the song had much potential to be a hit. After Dr. Dre heard the original production, he made sonic alterations and, according to Aftermath Entertainment A&R Mike Lynn, "made it sound like a record", a process he carried out on all of the other tracks on The Documentary. When Interscope Records chairman Jimmy Iovine later requested to hear the original production, he admitted could not tell the difference. Cool & Dre later praised the quality of Dr. Dre's mix, stating that "Dre brought it to life... [As a mixer is what] I think is his best quality... his ear for instrument placement is amazing". Built around a sample of the song "Rubber Band" by The Trammps, "Hate It or Love It" is backed by a soul-orientated production, which contains a "smoothed out R&B funk vibe". "Hate It or Love It" received general acclaim from critics. Scott McKeating of Stylus Magazine wrote that "It’s a great piece of warm soul-fuelled hip-hop, in which guest star 50 Cent manages to steal the show, considerably stepping up his lyrical content to squash together some great but clichéd lines against a level of his infamous smart arsed profundity." IGN described the song as "a smoothed out R&B funk vibe underneath the tales of the hood." Pitchfork listed the song as the 93rd best song of the 2000s. The song has earned The Game award nominations. In 2006 "Hate It or Love It" was nominated at the 48th Annual Grammy Awards for both Grammy Award for Best Rap Song and Grammy Award for Best Rap Performance by a Duo or Group, but lost in both categories to Kanye West's "Diamonds from Sierra Leone" and The Black Eyed Peas' "Don't Phunk with My Heart", respectively. "Hate It or Love It" was named number one on About.com's Best Hip-Hop Songs of 2005 and was ranked at #43 on VH1's "100 Greatest Songs of Hip Hop". The setting of the music video alternates between Compton, California and Jamaica, Queens, New York City, New York. The video recalls the rough childhoods of 50 Cent and The Game, showing where they come from, what it was like living in their neighborhoods, and the struggles they overcame as kids to become rappers. Tequan Richmond portrays The Game and Zachary Williams plays 50 Cent in their youth. In one scene, the two are caught spraypainting "N.W.A" on a wall, resulting in their arrest by two policemen. Big Fase 100, members of Black Wall Street, Tony Yayo and Lloyd Banks make cameo appearances. This video was nominated at the MTV Video Music Awards of 2005 for Best Rap Video, but lost to the video for Ludacris' song "Number One Spot". The music video was directed by The Saline Project. The official remix appears as track 22 on 50 Cent's album The Massacre as "Hate It or Love It (G-Unit Remix)" as a bonus track. It features the rest of the G-Unit members: Lloyd Banks, Young Buck and Tony Yayo. The first time the chorus is performed in this version, it is identical to the original, but the consecutive choruses have 50 Cent's line followed by another member of G-Unit rapping The Game's original line. While 50 Cent's opening verse and bridge are included in this version (though the bridge is altered), The Game's second verse is omitted and replaced with new lyrics. It is the only song recorded with all five members of G-Unit. Mary J. Blige covers the song on the single "MJB Da MVP" from her multi-platinum album The Breakthrough, with 50 Cent rapping his chorus line and Blige continuing with an altered version of The Game's original line. The Game is featured on the remix of the song. This is the second official remix. The Game's mixtape, You Know What It Is, Vol. 3, remastered into a diss towards G-Unit called "Hate It or Love It (G-Unot Remix)". On this, the lyrics are insulting all the members of G-Unit. The Re-Up Gang featured a remix of the track on their mixtape, We Got It 4 Cheap: Vol. 2. The song features the four members of the group rapping about their troubles in the past. ^ a b c d e f g h i j k l m "The Making of The Game's "The Documentary | "Hate It or Love It" f. 50 Cent". Complex. Complex Media. Retrieved 30 July 2011. ^ "The Game feat. 50 Cent's Hate It or Love It sample of The Trammps's Rubber Band". WhoSampled. Retrieved June 28, 2012. ^ a b McKeating, Scott (2005-01-28). "The Game: The Documentary". Stylus Magazine. Archived from the original on 2012-10-06. Retrieved 2011-03-29. ^ a b Staff (2005-01-28). "The Game: The Documentary". IGN. Archived from the original on 2008-06-29. Retrieved 2011-03-29. ^ "The Top 500 Tracks of the 2000s: 100-51". Retrieved 2014-02-07. ^ "BET Awards Nominees 2005". About.com. 2005. Retrieved 2009-07-02. ^ "2005 MTV VMA nominees". MTV. Archived from the original on 2015-09-26. Retrieved 2009-07-02. ^ a b "Complete list of Grammy Award nominations". USA Today. 2005-12-08. ^ "Australian-charts.com – The Game feat. 50 Cent – Hate It or Love It". ARIA Top 50 Singles. Retrieved 2011-03-29. ^ "Austriancharts.at – The Game feat. 50 Cent – Hate It or Love It" (in German). Ö3 Austria Top 40. Retrieved 2011-03-29. ^ "Ultratop.be – The Game feat. 50 Cent – Hate It or Love It" (in Dutch). Ultratop 50. Retrieved 2011-03-29. ^ "Ultratop.be – The Game feat. 50 Cent – Hate It or Love It" (in French). Ultratop 50. Retrieved 2011-03-29. ^ "Danishcharts.com – The Game feat. 50 Cent – Hate It or Love It". Tracklisten. Retrieved 2011-03-29. ^ "The Game – Chart history" European Hot 100 for The Game. ^ "Lescharts.com – The Game feat. 50 Cent – Hate It or Love It" (in French). Les classement single. Retrieved 2011-03-29. ^ "Offiziellecharts.de – The Game feat. 50 Cent – Hate It or Love It". GfK Entertainment Charts. ^ "Chart Track: Week 19, 2005". Irish Singles Chart. ^ "Charts.nz – The Game feat. 50 Cent – Hate It or Love It". Top 40 Singles. Retrieved 2011-03-29. ^ "Norwegiancharts.com – The Game feat. 50 Cent – Hate It or Love It". VG-lista. Retrieved 2011-03-29. ^ "Swisscharts.com – The Game feat. 50 Cent – Hate It or Love It". Swiss Singles Chart. ^ "Official Singles Chart Top 100". Official Charts Company. Retrieved March 03, 2011. ^ "The Game Chart History (Hot 100)". Billboard. Retrieved 2011-03-29. ^ "The Game Chart History (Hot R&B/Hip-Hop Songs)". Billboard. ^ "The Game Chart History (Hot Rap Songs)". Billboard. ^ "ARIA Charts — End Of Year Charts — Top 100 Singles 2005". Australian Recording Industry Association. Retrieved 2011-03-29. ^ "Annual Top 50 Singles Chart 2005". Recording Industry Association of New Zealand. Archived from the original on 2013-08-27. Retrieved 2011-03-29. ^ "2005 Year End Swiss Singles Chart". Swiss Music Charts. 2005. Retrieved 2011-03-29. ^ "End Of Year Charts: 2005" (PDF). UKChartsPlus. Retrieved 2011-03-29. ^ "2005 Year End Charts: The Billboard Hot 100". Billboard. Prometheus Global Media. 2005-11-26. Retrieved 2011-03-30. ^ "American single certifications – The Game – Hate It or Love It". Recording Industry Association of America. If necessary, click Advanced, then click Format, then select Single, then click SEARCH. This page was last edited on 13 April 2019, at 20:37 (UTC).